Trade paperback humorous military science fiction anthology. Featuring a mix of classic science fiction reprints and original stories by Baen regulars. 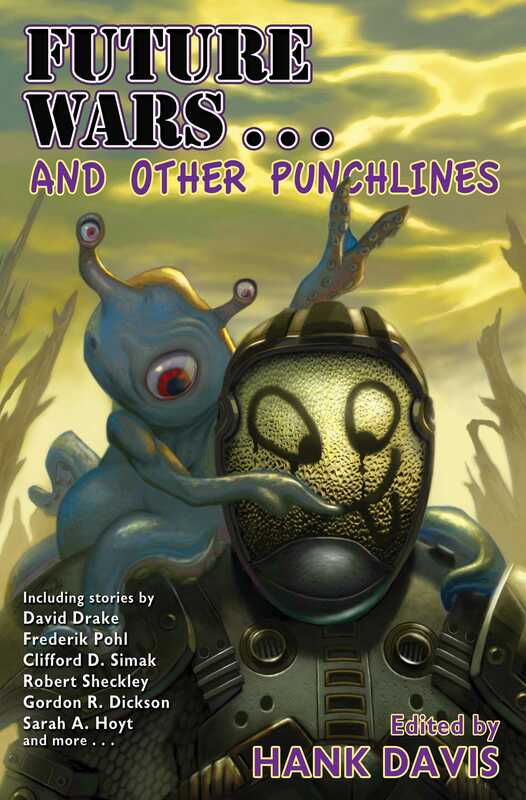 Includes stories by David Drake, Frederik Pohl, Howard F. Waldrop, Christopher Anvil and more. War, as the general said, is hell, but it also has its humorous moments, though the humor may be grim, and you “had to be there” to get the joke. War is likely to continue into the future, and into space, no matter how many idealistic speeches are made and U.N. sponsored treaties get signed, and so will the wartime jokes, ranging from slapstick to gallows humor. And if “you had to be there” to get the point, some of the best writers in science fiction are on board to put you there . . .
David Drake, the Dean of military science fiction, turns to fantasy and shows the result of having a combat balloon manned by halflings of dubious competence. Frederik Pohl tells of the invasion of Earth by aliens with impenetrable force shields, and how a goldbricking soldier with all the ethics of a career politician became an unlikely (and unwilling) hero. Herbert Gold considers the lighter (?) side of the strategy of M.A.D. (Mutual Assured Destruction). Theodore R. Cogswell, in a story which the Science Fiction Writers of America voted into their Science Fiction Hall of Fame, presents an isolated planet’s outpost, left behind after the collapse of galactic civilization, and the psychological subterfuge that kept morale from failing. Steven Utley and Howard F. Waldrop, in a Nebula Award and Locus Award-nominated work of alternate history, report on General George Armstrong Custer’s ill-fated mission when he and his dirigible-borne paratroopers were attacked by Chief Crazy Horse’s biplane squadron. Future war may be future hell—but there’ll also be future hilarity.